I think these month in a minute posts are a great way to look back and reflect on the month. My life is fairly static, I don't feel like my life is any different no to 10 years ago. Things must have changed but to be honest maybe not all that much as I type I'm watch The OC which was on between 2003 - 2007 so maybe life hasn't moved on so much. September might have been my busiest month of the year so far. It's been an amazing month and I've had a lot of fun. It started with me challenging myself to blog every day and I did. A couple of times I blogged 2 times in a day. I think I blogged more times in September than I have all year and I enjoyed it. I've also set up a blogging schedule and planed in some posts up to the end of the year, I have found my mojo after all. As mentioned before I've decided to rewatch The OC from series one. It's one of those show's I rewatch every few years and it still a favourite. I want to live in The OC. September has also been the months for events. I went to The Curve Fashion Festival in Liverpool, I had an amazing time and it really relight my fire to get back into doing fashion posts. BlogOnMSI will have also happened after I write this post. It will be my 4th event and I'm trying to put any event anxiety behind me. I'm going to go. No expectations, not try and please people. Just chat, say hello to as many people as possible and maybe learn some new things. 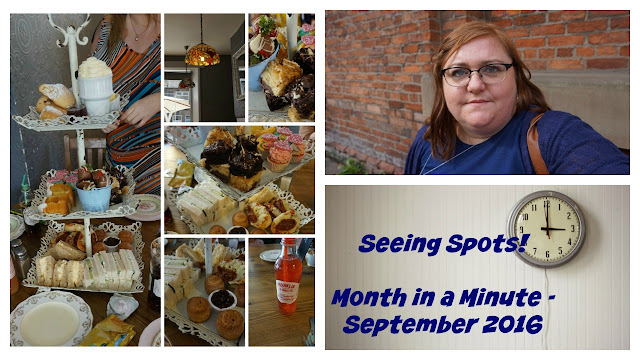 I finally went to The Vintage Cupcake Kitchen in Saddleworth for afternoon tea with my friends, we also had a wander round a craft fair and had a couple of drinks in a pub beer garden. There are a couple of other events coming up such as I've finally booked a hair cut and a second holiday which isn't until December but I'm sure it will come round fast. Hopefully as this goes live there will also be a Youtube video showing the highlights and I'd love it if you check that out. Don't forget to subscribe to my channel and leave me a comment. I need your help! What's in a name?